What is concrete with exposed aggregate? 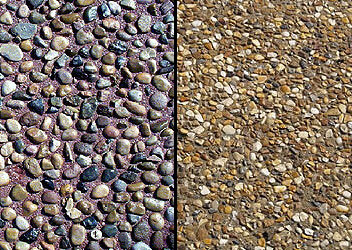 Exposed aggregate concrete is a form of decorative concrete achieved by removing the top layer of cement paste and revealing the underlying aggregate. The decorative aggregate now becomes a very durable, skid-resistant surface that is great for sidewalks, driveways, pooldecks, and patios. You can achieve some highly decorative effects at a reasonable cost since very few additional materials are needed. Some decorative aggregates, a surface retardant and sprayer, and a garden hose are the basic things you'll need. 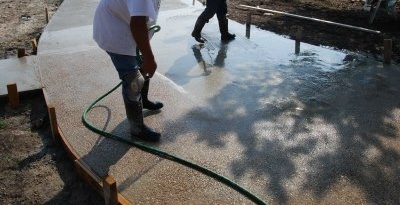 The procedures are simple enough for any concrete finisher to master fairly quickly. The surface is strong, skid-resistant, wears very well, and handles all kinds of extreme weather. Many types of aggregates are available, large and small, colored, round, plus many many more. Blends well with other decorative concrete. Requires very little maintenance other than occasional cleaning with water and re-sealing every few years. MONOLITHIC - The aggregates are batched right into the concrete truck at the concrete plant. This is the easiest and most common method. Usually a smaller aggregate is used called Pea stone. SEEDED - Immediately after the concrete is placed the decorative aggregates are broadcast, or hand placed, onto the surface of the concrete and floated in by hand. OVERLAY - This method is used on existing concrete that is in good shape. Aggregates are mixed into the overlay topping material and applied to the old concrete to give it a new look. The "secret" to exposing the aggregates is keeping the top layer of cement paste soft while the underlying concrete hardens. This is done by spraying on a surface retardant immediately after installing the concrete and aggregates. A few to several hours later the cement paste can be rinsed away with a garden hose or pressure washer and the aggregate is exposed on the surface. 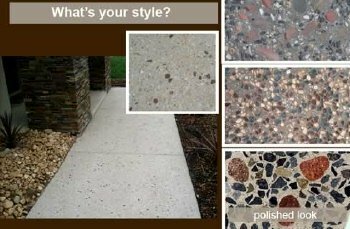 When compared to other decorative concrete styles, exposed aggregate cement is a lower cost method to having a terrific looking decorative concrete look. For information on other great concrete design ideas click on the links below.